November 5, 2015 (McLean, VA) The Professional Development Consortium is pleased to share the results of its first annual Legal Online Learning Trends, Benchmarks and Analysis survey, conducted in partnership with Steve Gluckman, PDC Trusted Advisor and Founder of LawFirmElearning. This report provides insights into current and future trends in online learning including how organizations are using online resources, budget allocations, and future interests in online learning endeavors. The results herein provide survey data collected and compiled from more than 70 PDC members in September 2015 about the current and planned use of online learning at their firms. A small percentage of firms are currently satisfied with their legal online learning efforts. Only 3% of survey respondents reported that they are extremely satisfied with their approach to online learning, 5% report that are offering more than 20 synchronous programs per month, 9% are transforming nearly all of their recorded live programs to self-paced e-learning modules, 9% have already amassed firm-specific e-learning libraries of more than 100 modules, and only 12% develop content specifically with e-learning in mind. Despite the majority of PD leaders recognizing the potential benefits online learning offers, many are dissatisfied with their current approach and outline challenges to achieving their vision. These challenges include understanding the cultural shift that online learning entails and the need for that shift to be planned and managed effectively. Securing the budgets necessary to fully implement their online learning vision is also a major challenge for many. Regardless of the challenges, growth and increased adoption is expected to continue at a significant pace. Respondents foresee real online learning growth in 2016 and beyond, with 35% expecting the number of synchronous online learning resources offered at their firm to increase in 2016 – and a full 67% expecting an increase in the number of asynchronous online learning resources (such as self-paced e-learning) offered during the same period. “The PDC is thrilled to partner with our Trusted Advisor and esteemed colleague, Steve Gluckman on this important initiative to collect and distribute valuable data regarding current and future online learning initiatives. Steve is a true expert, providing the gold-standard of information and advice when it comes to the development and delivery of online learning within our legal industry,” said Amy Hancock, PDC Chair. “I’m happy to see so many firms excited about online learning, recognizing that there is more they can be doing to offer online resources to their firms, and putting plans in place to do so over the coming year,” Steve Gluckman, PDC Trusted Advisor and LawFirmElearning CEO. For more information about PDC and this report, please contact Amy Lotz, CAE, PDC Executive Director, at alotz@pdclegal.org or 703-506-2027. 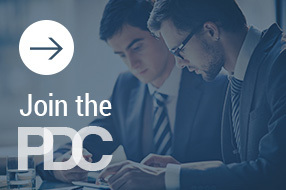 About the Professional Development Consortium (PDC): The PDC is a group of individuals working at law firms, law schools, government agencies and corporations who are responsible for creating and managing training and continuing professional development for lawyers and future lawyers. For more information, visit www.pdclegal.org.